07/04/16 – Site errors resolved! If you had trouble logging in this holiday weekend, try logging out and then back in. Referral program? Yes, one of the most generous out there. Pays $1.00 for each verified referral, $2.00 when the referral completes their first offer, and $5.00 each and every time your referral cashes out! Amazing! Paid? Yes! Pays every month when I have time to log in, about every other month if I don’t have time to visit other than the Daily PTC. Because this is an honest, trusted and legit site, I’m not updating my payment shots any longer. Older payments are below… an archive of even older payments is stored here. FusionCash Review: Recommended? Definitely. Everyone has only good things to say about this program. This is my top earner in all the referral-type programs I belong to. I get a lot of searches to this blog by people looking for “Fusion Cash Scam” — but this is no scam at all! 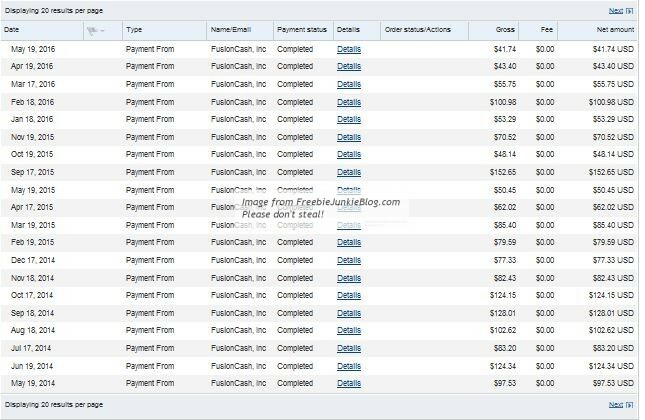 Fusion Cash is definitely legit. 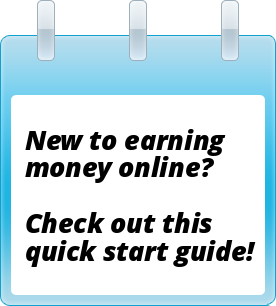 Many different ways to earn, no matter what type of work you want to do. Paid? Yes, paid many times. Current status as of December, 2015: The data entry bonus program is closed. For anyone looking for an alternative place to work, I’d suggest FusionCash for US/Canadian residents, and ClixSense for all other countries. You won’t be able to make as much there as you can at StoreHours24, but they both pay on a regular basis. Review: I found the original site, iStoreHours, via one of my PTC programs. I thought this looked like it could be a viable alternative for MTurk, so I decided to give it a shot. In a nutshell, you’re paid for entering the store information and hours for various retail and service businesses. This information is for a cool free mobile app and widget by the same name that’s available for Smartphones or Websites. There’s not much to registration; just a name and email address is required. They pay $0.05 per new store added, and once I get on a roll, I’m able to enter about two stores per minute. This is pretty much in line with the standard $0.10 per minute that most crowdsourcing opportunities over at MTurk offer, and there’s plenty of work to do. It takes a few days after submission to get your entries approved, to be sure that they are valid and correct entries and not duplicates. Their member support is excellent. I’ve written to them twice with small issues, and both times they responded in less than 24 hours. They do occasionally close the submission form from time to time for maintenance, catch-up, and when they reach goals for new entries, but they always list when they’ll be accepting work again. I really like this site as a good Mechanical Turk alternative. You don’t have to go searching for work to do. You can just sit down and start entering away for as little or as long as you’d like. Just be sure to read the rules on the site to see how they want the addresses formatted, and what types of entries are permissible to avoid rejections. In a nutshell, as long as your entry is unique, has correct information that can be verified, has no glaring punctuation or spelling errors, has a real, physical address and is not a duplicate, you will make money. If you enter gibberish, bad information, or a business that is already in the database, your work will be rejected. It’s very easy! I also love the idea of the app itself, as well. Coming from a metropolitan area where many places like large grocery stores or WalMart are open 24 hours, the idea of wondering if something was open was foreign to me. Once I moved to a small, rural location, I was surprised at the number of stores that had different opening and closing hours for every single day of the week. Definitely grab the app for your smartphone, especially if you travel a lot. They pay often and consistently, so I don’t feel the need to update these screen shots any longer. 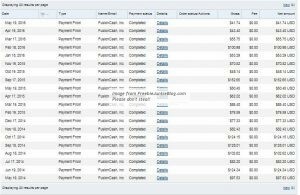 Screenshots from older 2012 payments are here and here, if anyone needs additional proof. They pay via PayPal or Amazon Gift Cards.